Jennifer Cluff: Flute for Smarties (Dummies) great! Flute for Smarties (Dummies) great! A tremendous bickering was had by all on one of the Flute discussion groups about the possible quality of the above book. Oh how funny. Perhaps the argument was about the humour of the title (which is really: Flute for Dummies) Who knows? So I'm laughing away, because if only they'd called it "for smarties...." But until you've read it, you can't really tell what the quality is. So I'm here to tell you that it's indeed a marvellous new book! It's absolutely chock full of everything you ever wanted to know about the flute but were afraid to ask, and it's practice-specific!! Everything you want to practice but were afraid to try...and I totally agree with the author on every technique. High school students just about to start private lessons, parents of pre-teen beginner flutists, and adult novice flutists who are between flute teachers will especially find this book an important resource, I imagine. And it's totally new and up to date. It just came out in Dec. 2009 by Karen Moratz. What a fabulous book all around! Huge kudos to Karen for writing it. A principal flutist of a top orchestra, and teacher for two decades, Karen Moratz has hit the nail right on the head on every topic from tone to tonguing to tuning. Everything the beginner-intermediate player wants to know. Finally, all in one place. And it actually does fit on the music stand, and the CD is actually very useful, and the exercises are excellent (LOVE the William Bennett harmonics/octaves warmup) and the text is clear, concise, fun and very appropriate. 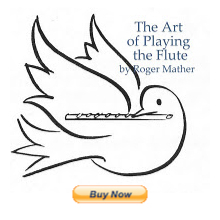 Run don't walk; every flutist should own a copy. You can get a good price ($15) here, and teachers can read a review copy at the link below. Thanks so much, Jen. LOVE the "new" title! I'm not surprised! Every "... For Dummies" book I've read has featured great content presented well. Glad to hear that this one is good as well. I'll definitely have to get a copy. My flute was in the closet for 35 years and just surfaced about six months ago. I recently started private lessons and am looking for a few good books too. Thanks for the recommendation. Just saw this one; I'll have to take a look at it. You're right, '...For Dummies' typically has great content, and even those of us that have been playing a while could pick up a thing or two.